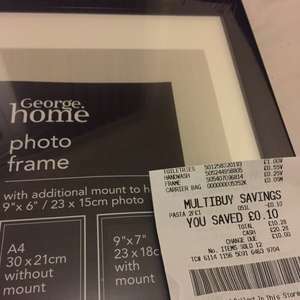 Black A4 photo frame from ASDA, usual price £2.50 but scanning at 25p! Not sure if in my local Asda which is Old Kent Road but could be nationwide. You're not really a deal seeker are you! You paid for a carrier bag! Or the staff are too lazy to change the sel. Asda staff and pro active.. 2 words that don't mix. Nothing to see hear men. Asda staff and pro active.. 2 words that don't mix. Nothing to see hear …Asda staff and pro active.. 2 words that don't mix. Nothing to see hear men. My brain is frazzled with all these glitch deals.. I need some photo frames!!! Three to be exact lol!!! Hot!!! Going asda tomorrow with my bag for LIFE!! Cold for using glitch. How dare you. I haven't tried but Is there a way to use negatives like -instore into the keyword notification so these wild goose chases don't send me an email? That's abit unfair It's not the staff that make the prices and decide to change them. The staff change the shelf edge labels or are supposed to. Yes but they only do that when they are told to and given the new tickets. If they arnt told about the price changes and to do that task then they don't know to. Yes but they only do that when they are told to and given the new tickets. …Yes but they only do that when they are told to and given the new tickets. If they arnt told about the price changes and to do that task then they don't know to. lol there is a person hired specifically for that job. usually more than one. they go round all day changing prices. or in smaller stores they should be done each day by department. probably easy to miss something like this but still there is a system in place to change them. lol there is a person hired specifically for that job. usually more than …lol there is a person hired specifically for that job. usually more than one. they go round all day changing prices. or in smaller stores they should be done each day by department. probably easy to miss something like this but still there is a system in place to change them. You just argued my point for me lol. There is a specific duty of one or 2 staff NOT all the sales assistants. My point was it's not fair to blame "sales assistants" which you have just confirmed for me It's not like all sales assistants are supposed to change the shelf edge labels or know that the prices have changed. That's what I was saying as some people abovejust go "ugh sales assistants in Asda are absolutely useless" because they didn't change the shelf edge label.